Critics may hate it, but Warner Bros. “Suicide Squad” is well on its way to the biggest August opening ever, after reeling in $20.5 million during Thursday night preview screenings. The weekend’s only other wide release, EuropaCorp’s “Nine Lives,” is yet to report Thursday numbers. “Suicide Squad,” the latest DC Extended Universe film, has been savaged by observers for its dark tone and jumbled storyline. It has an abysmal 27 percent score on review aggregator Rotten Tomatoes and a 41 on Metacritic. “Suicide Squad” nearly doubled the previous Thursday August record, held by “Guardians of the Galaxy” with $11.2 million. The movie made $2.4 million of that total on the 382 IMAX screens it played on. And after its stellar Thursday opening, early projections that the movie could open as high as $140 million — which would be the biggest August opening ever — look like they could be in sight, even with the wave of poor reviews. According to IMDb traffic data, “Suicide Squad” is outperforming the previous DC Cinematic Universe film,”Batman v Superman: Dawn of Justice,” which opened to $166 million in March. Warner Bros. is more conservative, estimating an opening weekend between $100 million and $125 million across 4,255 theaters nationwide. That would show the degree of devotion DC fanboys have toward the film, reviews be damned. Fans of the movie have even petitioned to shut down Rotten Tomatoes. 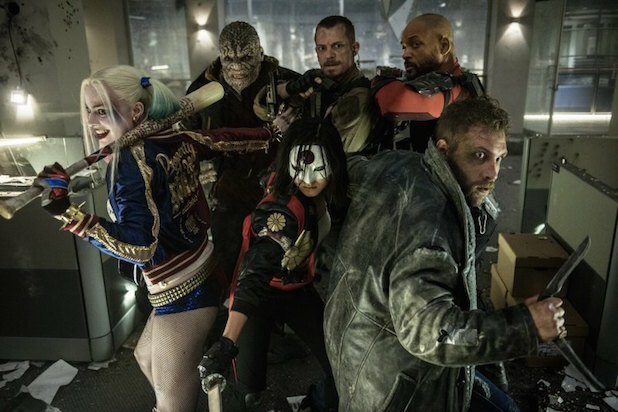 Director David Ayer‘s anti-hero mashup features a band of incarcerated misfit villains who are recruited by the government and assembled into “Task Force X.” Their assignment: defeat an enemy they are uniquely suited to take on in exchange for some relief in their sentences. The movie has an ensemble cast including Will Smith, Margot Robbie, Viola Davis and Cara Delevingne. It also features Joel Kinnaman, Jay Hernandez, Jai Courtney, Adewale Akinnuoye-Agbaje, Scott Eastwood and Ike Barinholtz. A $140 million opening for “Suicide Squad” would easily break the all-time August record, currently held by rival Marvel’s 2014’s “Guardians of the Galaxy,” which hauled in $94 million during its first weekend. It would put “Suicide Squad” in third place out of this year’s films, trailing only the $179 million opening recorded by “Captain America: Civil War” and the $166 million brought in by the previous DC Cinematic Universe film, “Batman v Superman: Dawn of Justice” — which was also panned by critics. Unlike “Batman v Superman,” “Suicide Squad” looks like it won’t be playing in China, where superhero movies — particularly those from DC rival Marvel — routinely bring in more than $100 million. Marvel’s “Avengers: Age of Ultron” took in $240 million last year. Warner Bros. had made significant efforts to help “Suicide Squad” become one of the 34 imported films allowed into Chinese theaters this year, from securing a PG-13 rating and even changing the Chinese title to “Task Force X,” after the Suicide Squad’s government name. But an insider told TheWrap that the movie’s dark tone and look likely was an insurmountable hurdle for China’s state censorship body, which has to approve every imported film. The lighter and brighter aesthetic of the Marvel Cinematic Universe seems to play better to both Chinese fans and censors. The other new movie of note, “Nine Lives,” stars Kevin Spacey as a father who becomes a talking cat. The film also features Jennifer Garner, Cheryl Hines and Cristopher Walken. “Nine Lives” is playing in just 2,264 theaters, and is expected to rake in between $7 million and $8 million this weekend. “Nine Lives” has not yet been reviewed, and therefore has no rating on Rotten Tomatoes nor Metacritic. With the paucity of major new releases aside from “Suicide Squad,” this weekend’s box office should include plenty of holdovers. Universal’s Matt Damon thriller “Jason Bourne” bowed to $59 million last week and should remain in the No. 2 slot. The government agent who proposes and handles the Suicide Squad -- a group that (mostly) consists of incarcerated bad guys looking for a get-out-of-jail (but-not-for-free) card. She's characterized as being tough as nails, which of course you'd have to be to think assembling a Dirty Dozen is a good idea. Harleen Quinzel originated in "Batman: The Animated Series" during the early '90s as the Joker's right hand, and that's the role for which she's always been known. Harley was a shrink at the famous Arkham Asylum, where she snapped while the Joker was incarcerated there, leading to the eternal and characteristic devotion. In many comics, this assassin for hire is an adversary of Batman. The world's greatest marksman with a rifle and other firearms, Deadshot is suicidal, after a fashion: he's one of those characters who seeks thrills in hopes that they'll lead to some kind of awesome death. Every story like this one has to have a grizzled military leader, and Rick Flag is it. But he's not a straight arrow, exactly. Flag is known to have a bit of a psychotic edge that generally is thought to suit him to those in his charge. June Moone was a totally normal person -- until she became possessed by some kind of weird ancient spirit. Now she's a split soul, as the Enchantress and June are hardly a unified entity. As the name suggests, Croc is kind of a lizard person, with scales and accelerated lizard-style regenerative abilities. He's also extra strong and stuff. Believe it or not, the film's physical depiction is a pretty mundane one -- in some of his other incarnations he looks pretty much just like a crocodile. An ex-gang member who wields the power of flame, he's known for truly seeking atonement for the really bad things he did with his fire powers. Digger Harkness is an Aussie dude who, obviously, does boomerang stuff. And, also obviously, he's a goofy dude who's totally unhinged and tends to serve in a kind of comic relief role. But don't underestimate the power of the boomerangs. She's not a bad guy -- instead, he's Rick Flagg's lieutenant and thus nominally second in command of the squad. Her real name is Tatsu Yamashiro, and she became a samurai after her family was murdered. Her sword isn't just some regular blade, however -- it can capture the souls of those killed by it. Like Captain Boomerang, Slipknot has a gimmick: rope stuff. He made his own ropes which are nearly unbreakable, and he can do pretty much anything with them. Not a member of the squad, but the Joker will play a major role in the events of "Suicide Squad" as a sort of chaotic interloper. Leto's take on the character is a bit different that any we've seen before -- a bit more, uh, ironic? -- but only the finished film will tell if all that preemptive ridicule was valid. "Suicide Squad" will mark Batman's first appearance on the big screen as the antagonist. His involvement is, of course, Joker related, and director David Ayer has said we'll be seeing him from the perspective of his opponents -- which should be a nice twist.